No more dried out turkeys! Find out how long to cook a turkey in the oven. 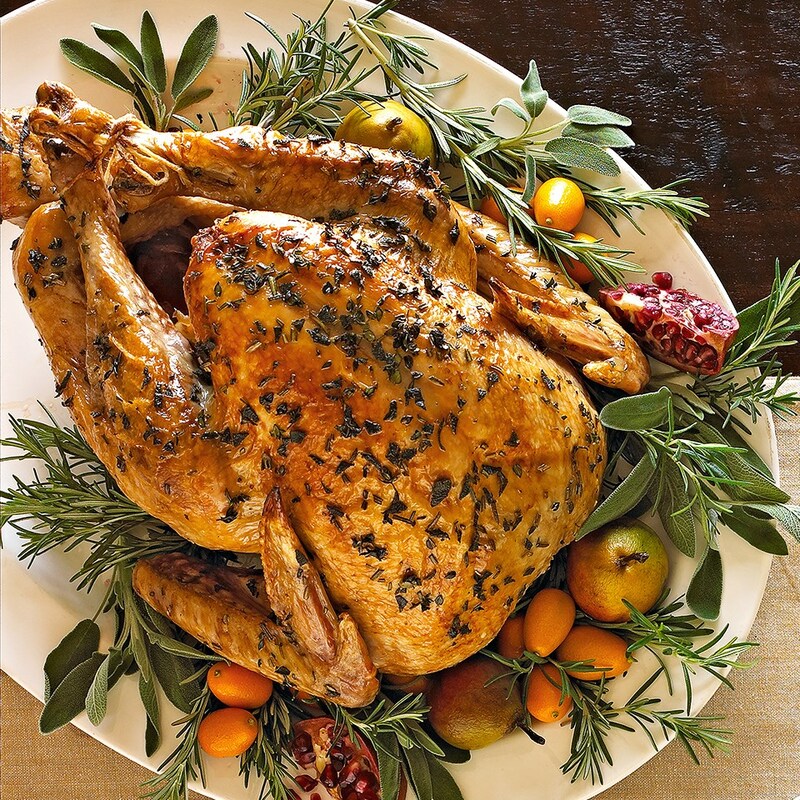 Plus, follow these easy steps to make the best moist and delicious herb-roasted turkey. Every year, the EatingWell Test Kitchen cooks at least half a dozen birds for the holidays—and I learn something new every time. Like the year a turkey caught on fire and blew open an oven. (The recipe called for an entire bottle of booze in the bottom of the roasting pan. Drippings from the bird ignited the alcohol and BOOM!) So, I learned: don't mix birds and booze ... inside the oven. Since then I've learned a lot more about the best way to cook a turkey. Whether you're cooking a whole turkey for Thanksgiving or another special holiday feast, these turkey tips ensure that you'll have a juicy, flavorful bird for the big feast. You can cook a whole turkey in five easy steps. This method produces all the good looks and moist flavor you dream of in a Thanksgiving turkey. 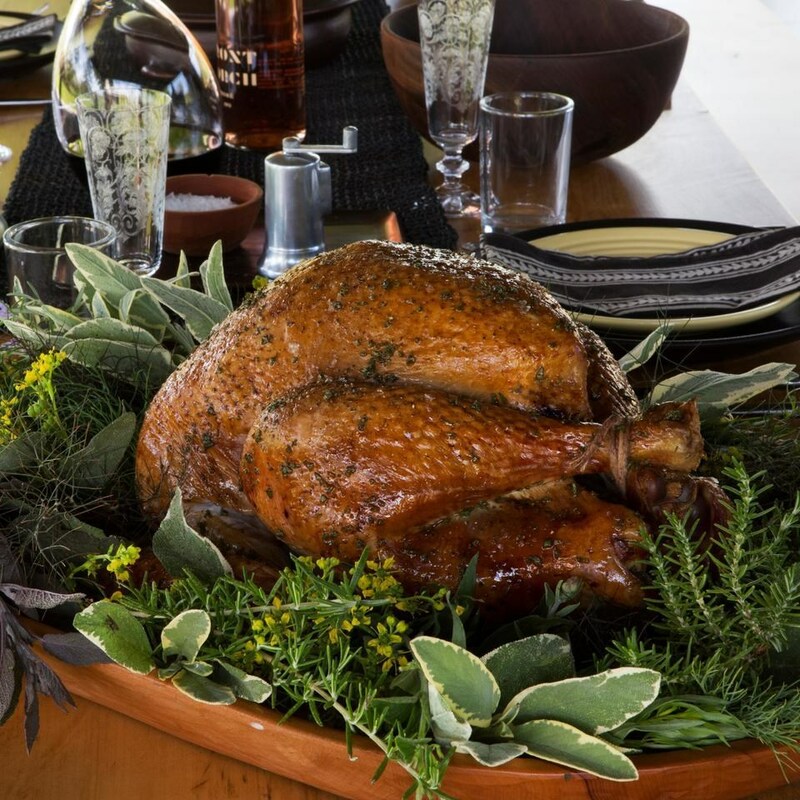 Try this technique with our Herb-Roasted Turkey recipe. Position a rack in the lower third of the oven; preheat to 475°F. Remove giblets and neck from turkey cavities and reserve for making gravy. Place the turkey, breast-side up, on a rack in a large roasting pan; pat dry with paper towels. Rub the prepared herb mixture all over the turkey, under the skin and onto the breast meat. Place aromatics in the cavity of the bird. Tie the legs together with kitchen string. Add water and herb sprigs to the pan. Roast the turkey until the skin is golden brown, about 45 minutes. Remove the turkey from the oven and cover the breast with a double layer of foil, cutting as necessary to conform to the breast. Reduce oven temperature to 350° and continue roasting for 1¼ to 1¾ hours more. If the pan dries out, tilt the turkey to let juices run out of the cavity into the pan and add 1 cup water. The turkey is done when an instant-read thermometer inserted into the thickest part of the thigh without touching bone registers 165°F. 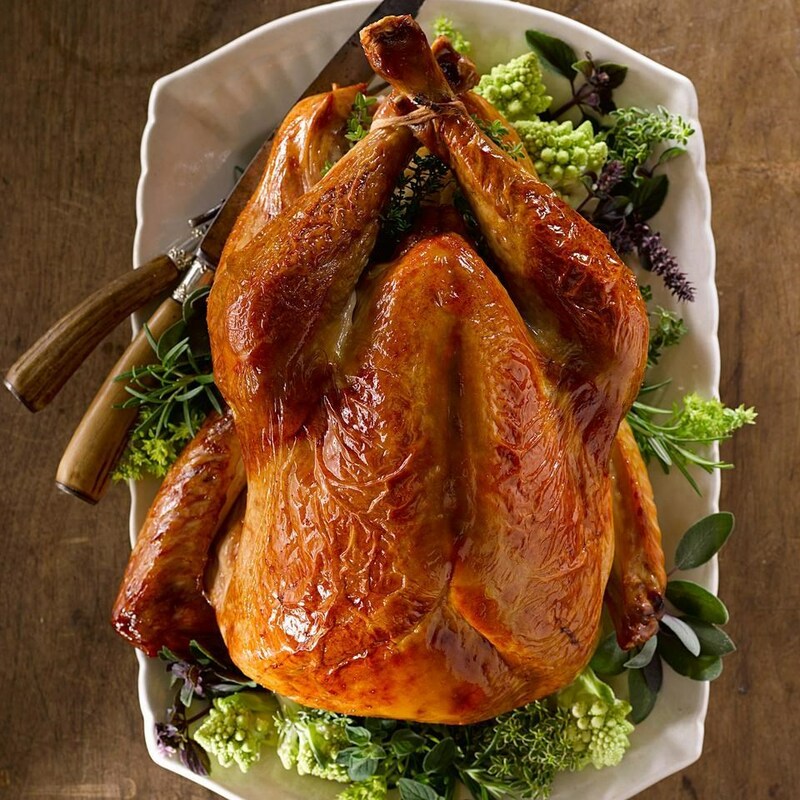 Transfer the turkey to a cutting board or serving platter and cover with foil. Let the turkey rest for 20 minutes while you make the gravy. Remove the string and carve. A healthy portion of meat is 3 ounces cooked, which works out to 1/2 pound of raw, bone-in turkey per serving. Calculate what you need based on the number of guests, plus your appetite for leftovers. Yes, it really does take this long. And always thaw your bird in the refrigerator. Make sure the cavity of the turkey is thawed, too, not just the outside. To test, get your hand in there (yes, in there): are there any ice crystals? If so, keep defrosting. • Buy fresh if possible. Frozen meat tends to leach more liquid when cooked—liquid you want to stay in the bird to keep it moist. Call ahead to see what your grocery or local farm offers. • Brine it. Submerging the bird in a salty liquid solution (a brine) results in juicier meat. Allow 8 hours or up to one day for the turkey to brine. • Let it rest. Don't cut into your bird for at least 20 minutes. (No, it won't get cold!) The juices will redistribute and stay inside the meat—where you want them.